If you're the sort that strives for that extra bit of tasteful ostentation, OnePlus' two original colors might not have made the cut. Gray and black are a bit bland, after all. As of today, those that match their metals (or those who intentionally don't) have another choice when it comes to the OnePlus 5. It can now be purchased in Soft Gold with a white face. The color has been particularly popular on OnePlus' previous offerings, and rumblings of the new color combo for the OnePlus 5 had been circulating since last week. It's strange that they would only offer it in limited quantities, but it could be that OnePlus wants to test the waters before committing to keeping a new color in stock. However, it could be this is legitimately a limited-time deal, so if you've been holding out for the metallic color, it might not be a great idea to wait too long. One other exciting bit of news accompanied this announcement. The Slate Gray OnePlus 5 will soon be available in the 128GB/8GB RAM configuration, too. There's no specific date set for that, though. 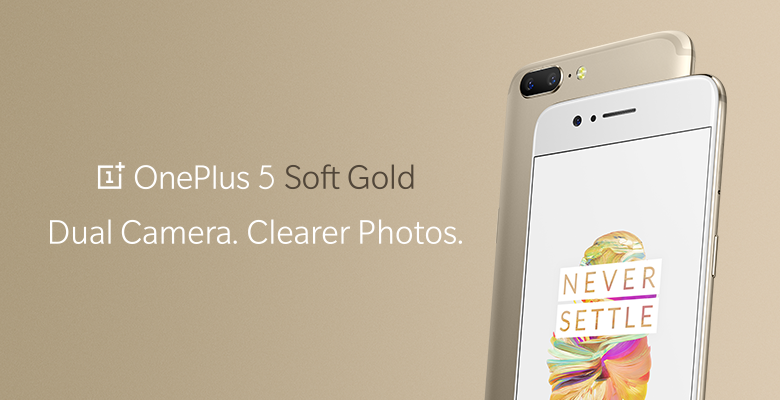 The Soft Gold OnePlus 5 can be purchased now for $479, but only in the 64GB/6GB RAM configuration. If you were hoping for the bigger storage capacity, you're out of luck. At least, for now.